The Airbrush tool emulates a traditional airbrush. This tool is suitable for painting soft areas of color. By using the A keyboard shortcut. 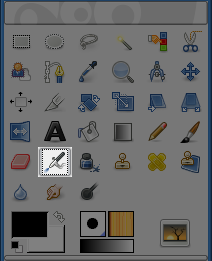 Ctrl changes the airbrush to a Color Picker. The Rate slider adjusts the speed of color application that the airbrush paints. A higher setting will produce darker brush strokes in a shorter amount of time. This slider controls the amount of color that the airbrush paints. A higher setting here will result in darker strokes.